The tasting was hosted in the office by Alex Burge who works with Andrea on the sales and marketing side. We looked at the wines that C&B last released and then ones we will next release in November (all shown in the photos). As background I buy the Cupole and Passopisciaro every year for myself and normally in large bottle formats – I love large bts and these come in mags as well as double mags!). I was as impressed as ever. 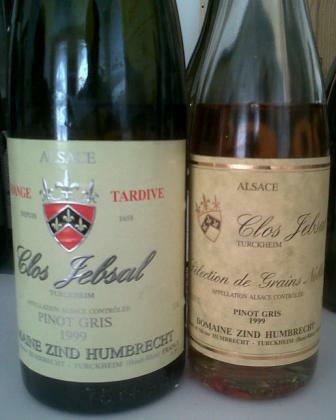 I won’t go on about the wines as they can all be found on the C&B site but the vintages are both good ones. The Sicilian wines are getting better and better. The Nerello Mascalese grown on slopes of Etna has definite similarities to both Pinot Noir and Nebbiolo – both very good things as far as I am concerned. Andrea produced four single vineyards wines (Contrada is the word for this, a little like Lieu dit in France) in 2009 as he did in 2008 the only shame is that the productions are pathetic. The Tuscan wines were all on great form with real richness but not overly powerful, delicious, Palazzi 2010 possibly sung the most at this stage. Lunch that followed at Zucca was a good relaxed affair, Alex had kindly given up some holiday time to see us. We had one white and one red. 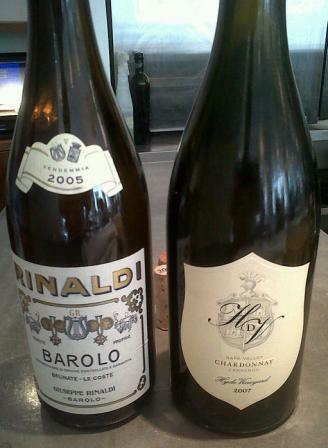 The white was 2007 Chardonnay from Hyde de Villaine in Carneros. I have shown this blind a few times and the elegance and poise always means people say burgundy, Alex thinking Puligny, I though Meursault last time I had it blind. Either way decanted it was delicious with an array of starters (always the way to do it at Zucca). For the red (to go with a mammoth Veal chop in my case) I wasn’t going to miss the chance to further explore the wonderful Piedmont list. This time I opted for one of the growers I buy blind for myself every year now – Guiseppe (Beppe) Rinaldi – it was his 2005 Barolo Brunate-Le Coste, I expected it to be enjoyable but obviously too young and whilst I will keep the case or two I have for a long while yet I was staggered at it’s balance and openness now…a very classy bottle. If you can find his wines I strongly recommend buying them, failing that get to Zucca and try them there.